It’s a fact that most customers check you out online before “taking a chance on you” — especially the new customers critical to the healthy growth of your business. What do they see when they go online? They see review sites with comments sometimes all over the board, and sometimes with unjustified negative and damaging reviews from competitors, unhappy employees and people that just want to do harm. Negative reviews, unfounded or not, can make or break a business. You can’t control the content on those sites, even when it is false and libelous — at least not without great and impractical effort and legal expense. That is where the value of the Pulse Award is found! 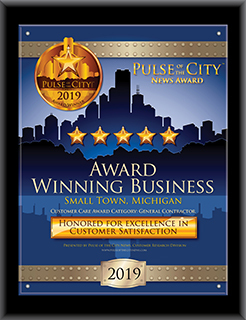 The Pulse of the City Customer Satisfaction Award provides a straightforward, stable rating from an unbiased, independent, credible source that attests to your customer satisfaction track record! And you can ensure that they see this information by following the simple steps we have laid out for you. This award can’t be bought. Our research is provided at no charge and posted on our website for everyone to see.